New Forest half term events I can recommend. Beaulieu hosted two great family events for Spring half-term. Two great family events were staged in the grounds of the National Motor Museum at Beaulieu, in the heart of the New Forest National Park. Trucks & Troops was a three-day show running from Saturday 29th May to Bank Holiday Monday 31st May. It celebrated the 65th anniversary of VE Day, Trucks & Troops showcases military transport, combat vehicles and soldiering through the ages. Over 250 military vehicles were on display, everything from push-bikes to armoured and tracked vehicles, ranging from pre WWll to the Gulf War. Re-enactment groups talked to visitors about life as a soldier and re-created camps and situations in which they would have lived and served. On the Beaulieu Arena, visitors watched parades of vehicles and marching bands. Activities for younger visitors included a Commando Assault Course, a Model Boat Pond and Model Tank Village. You could dress up in Army camouflage, including camoflarg face paint, and take part in a patrol with real soldiers from the modern British Army. Visitors to both shows could also see all the other Beaulieu attractions, which are worth a visit on their own! 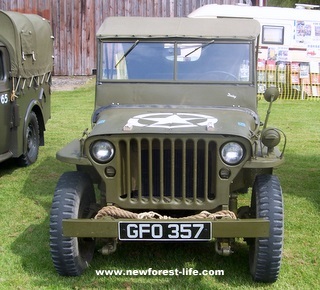 The National Motor Museum is located in the New Forest at Beaulieu and holds many events. 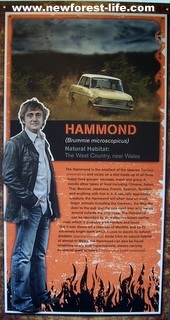 We recently visited its latest exhibition, ‘ProMotion’, and World of Top Gear and we thought it was great! 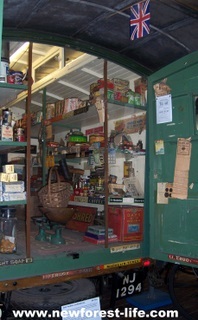 On the 5th and 6th June a brand new show, the Beaulieu Steam Revival, was staged. Among the major attractions on display were the magnificent Showman’s Engines that could be widely seen at the Fairgrounds of the Victorian era. 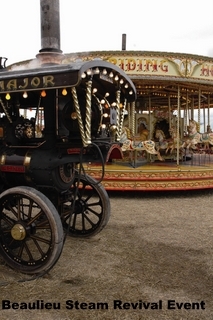 The show had its own Old Time Steam Driven Fairground offering free rides on traditional rides including Gallopers and Speedway, as well as strolling players and side shows, creating the atmosphere of a Victorian travelling fair. Show visitors saw working steam cars on display and moving around the site, as well as live demonstrations of steam threshing, road building, cider making, live boiler foundry works, plus many more surprises around each corner! There was a trailer and steam engine rides for everyone to enjoy. Making a special appearance was the World Land Speed record breaking British Steam Car, that last autumn, smashed the 100 year-old world land speed record with a speed of 139.8mph over the measured mile. The Palace House and 13th century Beaulieu Abbey are beautiful and also not to be missed is the Secret Army Exhibition which tells the story of wartime Beaulieu and the training of secret agents to work with the Resistance in occupied Europe during WWll. Beaulieu is open from 10am each day with plenty of free parking. For more information telephone 01590 612345, or visit: Beaulieu Events to find out lots more that is going on throughout the year. See my Beaulieu Review to find out what a great day out a visit to Beaulieu is. Weather Update with a Widget! Family Tree Forum - who knows of your relatives? Welcome to my New Forest National Park Life! Let me share my animal photos and tales with you. Explore my personal recommendations too. Missing cat from Challenger Way area in Dibden. I promise to use it only to send you New Forest Life Tales. No image or text reproduction permitted without permission. I live in the beautiful New Forest National Park and want you to share this life with me- that's why www.newforest-life.com is unique - so please enjoy!